Measurements: 7.5 cm W x 27 cm H x 30.5 cm DiameterMeasurements taken from the widest part of the bottle. Narrative: Case bottles were in use between the 17th century and the 20th century. Source: Nova Scotia Museums. 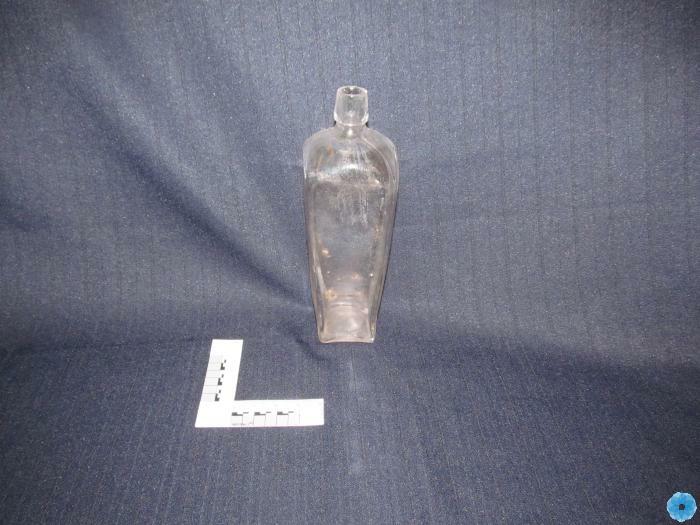 Description: A clear glass case bottle with a large lip, no neck and long body. The body tapers from 3" width to 2.25" width at the base. There are no trademarks on the bottle. History of Use: case bottles are square bottles that are easily packed into a case. Their use was not confined to gin, although they may have been used for gin more than for any other beverage. They used from the late 18th century until well into the 20th century, making these bottles difficult to date.